The GoTo Seat is a lightweight and portable support seat that promotes mobility, ability and participation. Our updated design features improved lateral support, a choice of headrests and an optional Floorsitter and pressure relief cushion accessory. Developed in collaboration with Cerebra, the GoTo Seat began as a simple trolley seat to make shopping trips easier for families. 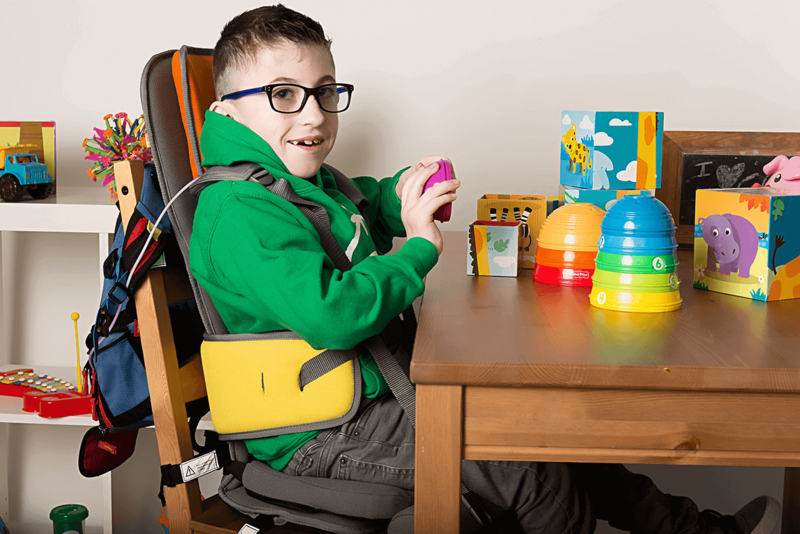 However, its supportive and practical design meant its application quickly broadened to enable children to sit on most standard chairs in the home, in restaurants, in classrooms or in therapy sessions. 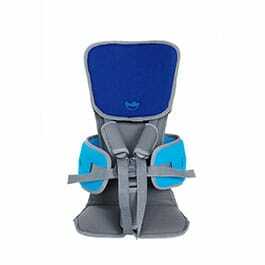 More recently, the GoTo Seat has been successfully tested for use in cradle-style swings and has been approved for use by Air Canada, Thompson Holidays and EasyJet airlines. Broader lateral support and extra adjustability provide increased lower-trunk support, encouraging pelvic and trunk stability. The new GoTo also promotes sitting tolerance, proprioception, spatial awareness and fine motor skills, as well as offering two choices of headrest, both designed to encourage greater head control. The new GoTo Seat offers an optional Floorsitter accessory that lets children sit in their GoTo seat on a flat surface and interact with family and peers at floor-level. It promotes a wider range of social, travel and family experiences, meaning that there are many more opportunities for participation and social development than ever before. Families and professionals use the GoTo in all kinds of imaginative and useful ways - whether it’s eating out together at restaurants, playtime with siblings, grocery shopping with Gran or circle time at school. The GoTo Seat is designed to be attached to a rigid structure (e.g. a dining chair or similar) to safely support children. If the supporting seat is not stable, safe and rigid, then you should not use the GoTo on this structure. For extra security, it is also recommended that all three straps are used to secure the GoTo to the supporting chair wherever possible. Although comfortable and secure, the GoTo Seat should only be used for limited periods as it is not pressure relieving and should not be considered a primary seating system. For more information on GoTo activities and on how to use the GoTo seat, browse our Useful DownloadsSection. There you will also find instructions for assembly. *Please note: The maximum weight limit for a child in a standard shopping trolley seat is 13kg. This means that only the GoTo Seat Size 1 will be suitable for shopping trolleys in most circumstances. Refer to the Technical Information section within the User Guide for further guidance on this. To read about clinical applications of the GoTo seat, visit our Case Histories Section. At Firefly, we love hearing this feedback - participation is what we’re all about. And now, to help parents and therapists get the very most out of the GoTo seat, we’ve created a GoTo Activity Programme. Based on the World Health Organisation’s ICF-CY framework, this Programme provides parents and therapists with a range of Mobility, Ability and Participation activity suggestions that children may benefit from whilst using their GoTo, and they’re organised in to easy-to-follow sections. "I have been involved in the area of positioning and seating for young people with disabilities for some time now. The flexibility of the GoTo seat is extremely useful."